I was browsing Instagram one day and came across a gorgeous cake by America’s Test Kitchen and learned that they published a new cake cookbook last year! I immediately ordered that book (of course), and then saw that they also published a new cookie cookbook, too! My mind was blown! It was difficult deciding which of these two books to begin using first, but I decided to start simple with Chocolate Sugar Cookies (since I’m such a huge fan of ATK’s Brown Sugar Cookies). This recipe for Chocolate Sugar Cookies comes together very quickly and does not require any special ingredients. I really like America’s Test Kitchen’s recipes because anyone can follow them! I did, however, need to make some notes in the margins when prepping for this recipe. It’s always tricky figuring out when chocolate cookies are done baking because they don’t change color. It’s a good idea to check to see if the edges have set about 2 or 3 minutes earlier than the suggested baking time since everyone’s ovens are different. Adjust oven rack to middle position and pre-heat oven to 350 degrees F. Line 2 baking sheets with parchment paper. Spread granulated sugar in a shallow dish or bowl and set aside. Whisk flour, cocoa powder, baking soda, and baking powder together in a bowl. Melt 10 Tbsp butter. In a large bowl, add melted butter to the remaining 4 Tbsp butter (it helps if the 4 Tbsp butter are cut into smaller pieces so they melt easier). Let butter cool to 90 to 95 degrees, about 5 minutes. Whisk brown sugar, vanilla extract, and salt into melted butter until no lumps remain, scraping down the bowl, as needed. Whisk in the egg and egg yolk until smooth. With a silicone spatula or spoon, stir in the flour mixture until just combined. Working with 2 tablespoons of dough at a time, roll into balls, then roll in granulated sugar to coat. Space dough balls evenly on prepared sheets. Gently press down the balls into 2-inch circles using the bottom of a clean, dry measuring glass. Evenly sprinkle the remaining granulated sugar over the cookies. Bake 1 sheet at a time, until cookies are slightly puffy and edges have begun to set (cookies will look raw between cracks and seem underdone), about 14-15 minutes, rotating sheet halfway through baking. Let cookies cool on sheet for 5 minutes, then transfer to wire rack. Let cookies cool completely before serving. 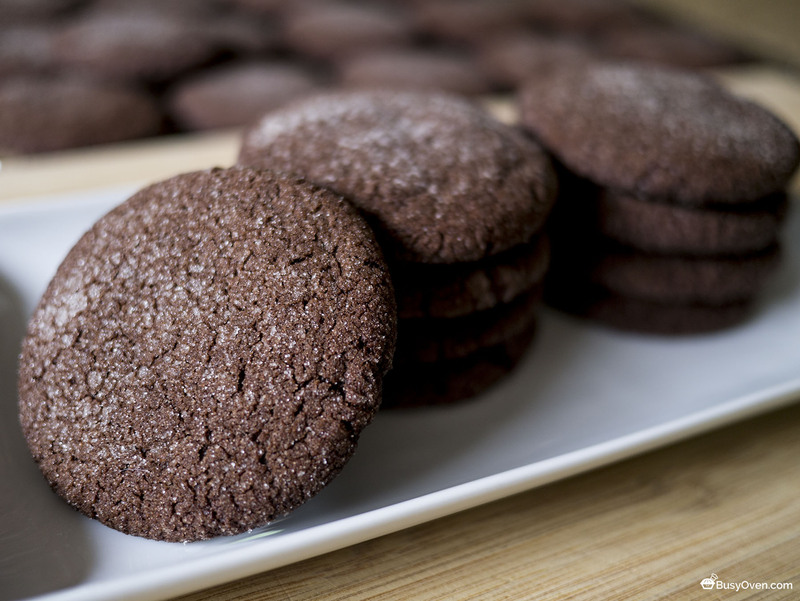 Chocolate Sugar Cookies recipe is on page 40 of The Perfect Cookie from America’s Test Kitchen.